On Tuesday afternoon at 1:30, Landon will be taking questions from fans at this site. This chat will give fans across the country and around the world the chance to pose their questions to the Galaxy star in Spanish as ESPN works to promote Thursday night's game against the Earthquakes, a match that can be seen everywhere on ESPN2 and ESPN Deportes, in addition to being available on the radio on KWKW 1330 AM here in LA and on ESPN Deportes radio nationally. For those who would rather hear what Landon has to say rather than read it, he will be a guest on the Jeff and Dave Show on XTRA Sports Radio 1360 out of San Diego on Tuesday morning around 9:35 a.m. Click here to listen live to XTRA Sports Radio 1360. I hope he addressed how they will score goals with Ruiz out 4-6 weeks. i want to see some defense in the home opener. 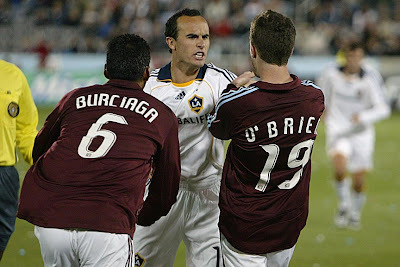 or maybe a nice becks free kick to donovan header for the goal. Landon you should have thrown a right cross when you had him by the throat. He would have deserved it.